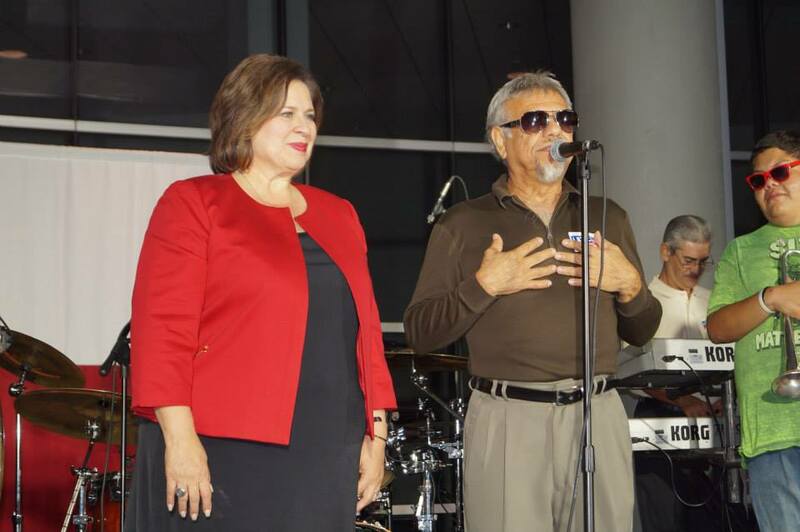 With the help of Tex-Mex legend Little Joe Hernandez, Leticia Van de Putte, Democrat for Lt. Governor, energized activists at a rally held at the Communications Workers of America Hall in Houston. Along with a fiery speech by Van de Putte, Little Joe y La Familia performed for the crowd. Van de Putte has been on a bus tour of Texas that will take her 6,000 miles to dozens of towns and cities. Energetic crowds have welcomed her and have turned into phone banking activists for the candidate and the slate of Democrats. Van de Putte has challenged right-wing favorite Dan Patrick for his divisive vitriol and attacks against immigrants, women, and others. Calling it a lack of respect for these groups, Van de Putte has vowed to run an effective State Senate, rather than one based on agendas, such as Patrick’s. Little Joe added that it is Van de Putte who will serve all Texans, especially those who often go ignored–the poor, minorities, women. Hernandez has been a vocal supporter of Van de Putte and Wendy Davis, as is evidenced in the video below, as he performs the anthemic, Las Nubes. This entry was posted in DC Promo, Democratic Stuff, Elections, Las Mujeres and tagged houston, las nubes, leticia van de putte, little joe y la familia, rally. Bookmark the permalink.